Chris grew up in the Green Mountain state enjoying all it has to offer and developed a love for the outdoors and the great seasonal activities that go with it. He earned a BA from UVM in Biology and joined the Coast Guard to get a taste for life on the open sea. He worked as an electrician and diver while making a few trips to the wilds of Antarctica. 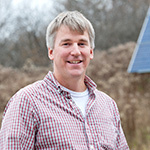 Chris found his way back to Vermont and nurtured his growing interest in renewable energy, earning an electrical engineering degree from Vermont Technical College, and now finding himself happily designing solar systems with SunCommon for the people of Vermont. He lives in Montpelier with his wife Joey, daughter Lila, and dog Yukon. Read more about Chris on our Blog!